If you are looking for Aluminium Flat Bar supplied in the UK cut to size, then you are in the right place! We offer all our Aluminium Flat Bars in several handy lengths, and using our integrated cutting service, you can get each length cut to an exact size Free of Charge. All our Flat Aluminium Bars and Aluminium Flat Strips are extruded. The extrusion process produces bars that have perfectly square edges, and nice square corners. Unlike sawn Aluminium Plate and guillotined Aluminium Sheet, the corners of the section are smooth, and not sharp to touch. Therefore, only the cut ends are likely to need treating or filing before the Aluminium Flat Bar can be used as a finished product without the chance of accidental injury. The vast majority of our Aluminium Flat Bars are supplied in grade 6082T6. This is a great general engineering grade of aluminium. Aluminium Flat Bars in grade 6082T6 (also known as grade H30) are suitable for machining, tapping and drilling. It has good strength properties and is used for structural applications. Aluminium Flat Bars also have good weldability properties – if you require your aluminium flat bar welding, please contact us for a quote. Aluminium Flat Bars also have excellent anti corrosive properties, and they are also suitable for polishing, powder coating and anodising. If you require cut pieces of Flat Bar Aluminium that are wider than 6”, please see our Aluminium Plate section of the website. Here we offer Aluminium Plate from 8mm up to 2.1/2” (63.5mm) thick with a choice of widths – 6” (152.4mm), 7” (178mm), 8” (203mm), 10” (254mm) and 12” (305mm). 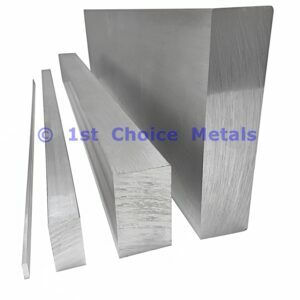 Aluminium Flat Bars are used in a wide variety of applications. The smaller, lighter sections are often used as decorative trims and as small spacers and thresholds. The larger, heavier sections are often machined to size to create smaller components for the automotive, rail and other manufacturing industries. Should you not be able to see the size that you require listed on the website, please contact us with your requirement and we will advise if we can source the required size.